Steam generators are used to harness energy liberated as heat in a wide variety of processes and convert it into a form which is more useful, such as mechanical and electrical energy. The heat used is typically produced intentionally for the production of electricity or is captured as a byproduct of some other industrial process. The immediate source of the heat is usually dirty, such as the radioactive fuel in a nuclear power plant, so the first step of steam power generation is to transfer that heat into clean water with a heat exchanger. This is done by having the heat source elevate the temperature of an exchange medium, such as an oil, that is circulated in a closed circuit. The oil in turn heats a water reservoir without contaminating it. The hot oil is circulated through a water bath to generate steam. There are several different geometrical schemes for doing this, but the principle remains the same. The heating liquid is diverted into many smaller pipes to increase its surface contact with the water and facilitate rapid heat exchange and steam production. The steam produced in modern nuclear and coal power plants is often at supercritical conditions, or above the critical point in water's phase diagram (374 degrees Celsius and 22 MPa). Supercritical steam is overloaded with energy. 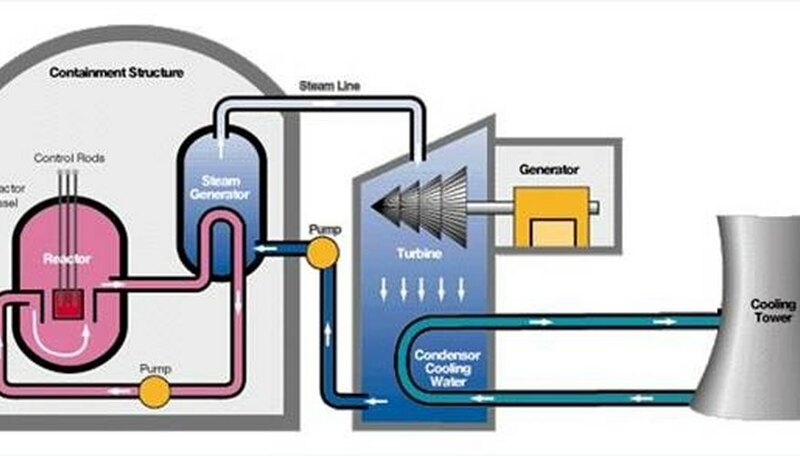 Steam's energy is converted into mechanical energy by forcing it through a steam turbine. 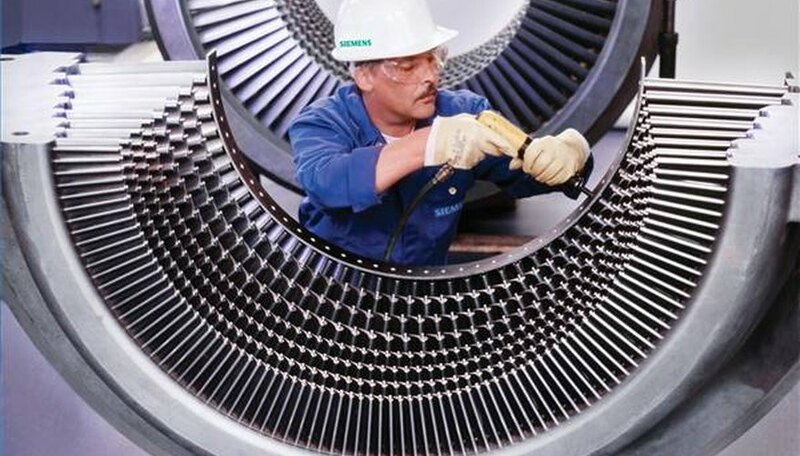 The high pressure of the steam pushes on the many angled blades of the turbine, causing the shaft to rotate. This mechanical energy is converted to electricity by using the power form the rotating shaft to turn an electrical generator. 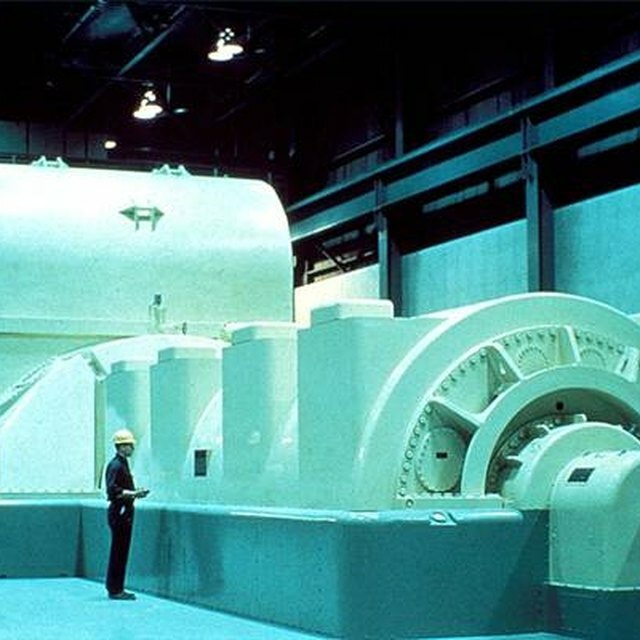 The turbine being built in the image may generate up to 65 megawatts of electricity. Matthew R. Jorgensen has a B.S. in chemistry from Utah State University and is currently a Ph.D. candidate in physical chemistry at the University of Utah. Jorgensen, who has been writing professionally since 2006, has received awards and scholarships for his scientific achievements, which have led to publications in the scientific journals "Advanced Materials," "SPIE," "Applied Spectroscopy," and "Journal of Materials Chemistry." R., Matthew. "How Steam Generators Work." Sciencing, https://sciencing.com/steam-generators-work-5095506.html. 24 April 2017.